Professional Android 2 Application Development, started shipping today (Monday) from Amazon US - so those of you who pre-ordered should be seeing your copies in a couple of days. I'm really excited and can’t wait to find out what people think. A lot has happened in the year since Professional Android was released. In November of 2008 version 1.0 of the Android SDK had only just been released. There was one handset (the G1) on one carrier (T-Mobile) in one country (the US). As Professional Android 2 rolls off the presses there have been 6 new platform releases (up to Android 2.1), and Android is now available on 26 handsets in 48 countries on 58 carriers. Understandably much of the original Professional Android material is now out-of-date. Accordingly, Professional Android 2 has been totally revised and expanded to cover all the changed and new API features introduced in the past year up to and including Android 2.1. That includes the new Bluetooth API, Widgets and Live Wallpaper, the updated contacts and Sensor APIs, the new ASyncTasks and Services framework, as well as expanded sections covering using the camera, microphone, and media framework. In all there are an extra five chapters and over 100 more pages. Oh, and there's a new cover image that is so awesome it's almost enough to justify replacing the older copy by itself. I'll be looking to answer Android questions at the Wrox P2P forums, Stack Overflow, and the Android Google Groups. For more information on Android and the book you can follow me on Twitter or Buzz. I'll tweet any 'bugs' and changes to the text or code samples, as well as updates on any SDK releases that cause book code samples to break. just like the cover very much, what more about the content! Yeah, digging the cover. You're beautiful man but when you remove our skin and reveal your Android exo-skeleton, that does it for me. Looks good! I've preordered a copy from amazon.co.uk. hope James Cameron doesn't sue you for the lovely cover. Also: I fixed the Amazon.co.uk link (thanks fer!). A new area has started : Paper is cheaper than bits. It's not green at all. Good job for your book. It look like from this cover picture book has more see through of Android. Today I stand on with Android because of the professional Android Development by you. You are Guru for me. Thanks Guruji for making me learnt Android. When it is available in Indian market? i like the termiator cover, does it have a nexus one in its head? 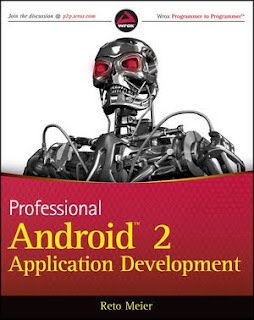 I just saw another review and I must say that this Professional Android 2 Application Development is a must have. I will grab a copy this weekend. I'm waiting for my copy to arrive. I live in Spain so I ordered it from Amazon UK and it's a bit slow. Hope to have it with me in a couple of weeks. I read your first book and I hope the second edition to be as good or better than that one. Love the book but in need of assistance. Something wrong with the code in Chapter 4 in the "Creating a new visual interface" section - the code crashes the emulator. all that investment into a book with faulty code and then no help/response from the author. So stuck I'm going to have to get a different and better book to get my education in Android back on track. Cover is like pretty good. Hope 2nd edition will also very useful & good. I like this book but I need a help! Please revise your sample project codes in this book!. From chapter 6 todolist which is not working!